T cell-based therapies, or “living drugs” as coined by Dr. Carl June, utilize the potent killing activity of T cells, an arm of the immune system, to target cancers. In the early stages of T cell-based therapy, T cells were isolated from tumors, expanded ex vivo, selected for specific anti-tumor clones, and infused back into the patient. Nowadays, T cell products are genetically modified to express receptors to more specifically target cancers with better persistence in patients. So how are these “living drugs” manufactured? 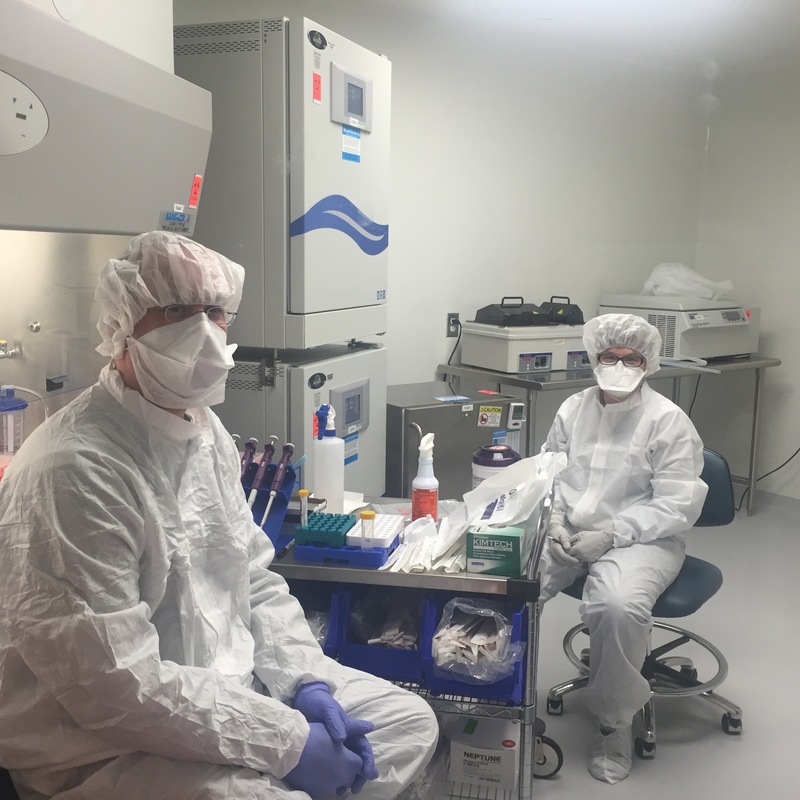 Here at UNC, a Good Manufacturing Practices (GMP) facility housed off of NC-54 generates all the T cell products used in phase I/phase II clinical trials by the Lineberger Comprehensive Cancer Center. These facilities are regulated by the US Food and Drug Administration under the authority of the Federal Food, Drug, and Cosmetic Act. Laboratory technicians working hard at UNC GMP. I spoke with Paul Eldridge, PhD, Director of the UNC Lineberger Advanced Cellular Therapy Facility, to learn more about how GMP facilities work. Dr. Eldridge was recruited in 2014 by the Lineberger Comprehensive Cancer Center, which was interested in starting a cellular immunotherapy program and building a GMP facility. Dr. Eldridge’s personal interests are in chimeric antigen receptor T cells (CAR-Ts) and hematopoietic stem cells, with a focus in cancer immunotherapy. Lee Hong (LH): What products are manufactured at UNC’s GMP facility? 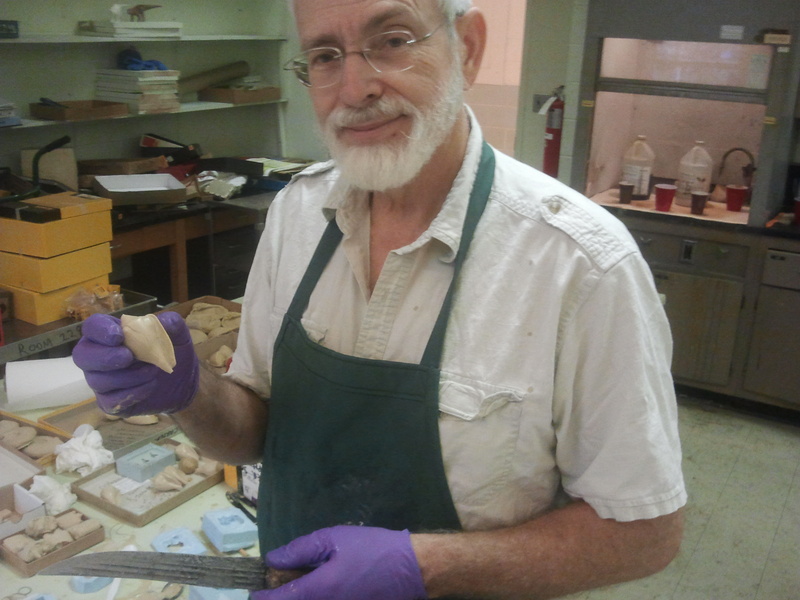 Paul Eldridge (PE): Here at UNC, we focus on advanced research products. The FDA divides cell products into minimal manipulation and more than minimal manipulation. Minimal manipulation essentially does not change the character of the cell, which means you can isolate, purify, or freeze the cells. More than minimal manipulation involves putting cells into tissue culture. LH: Huh, why is that? Tissue culture facility at UNC GMP. PE: Well, when you put cells into culture, they are dividing, experiencing a different stimulus in the culture medium, and may differentiate into other cell types. In other words, anything that could potentially change the innate nature of the cell is considered more than minimal manipulation. Certainly gene manipulation would be included here as well. How you intend to use the cell products, what the FDA calls “homologous use,” also matters. If the investigator is intending to use the cells in a manner that it is not normally functioning (i.e. non-homologous use), the FDA kicks those products up to a higher regulatory environment and calls them more than minimal manipulation. 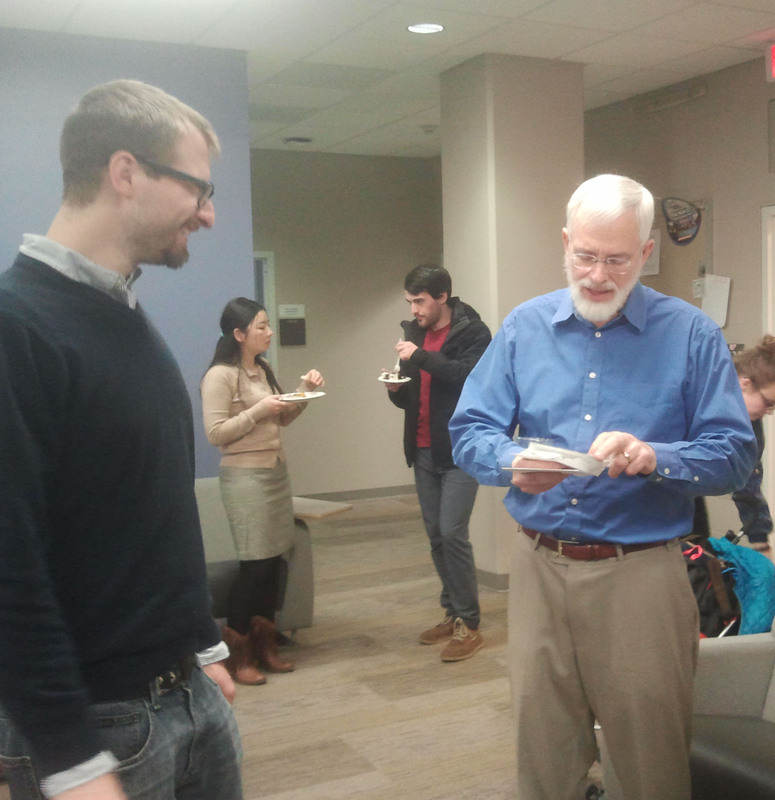 LH: So at UNC, are most of the advanced research products you work on derived from peripheral blood? 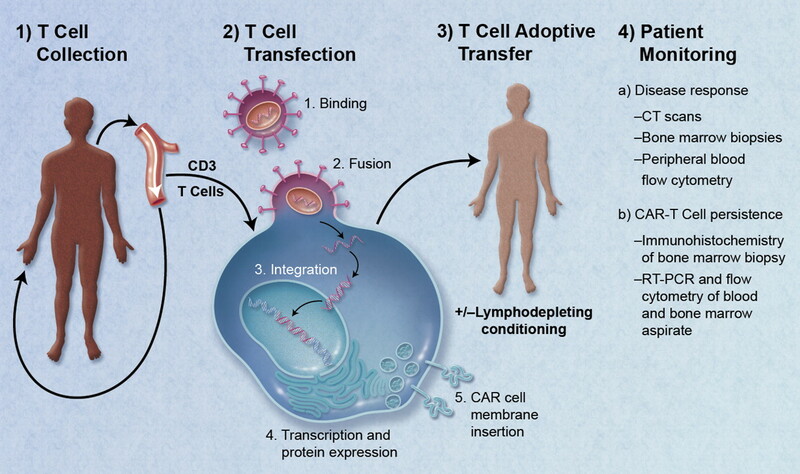 PE: Yes, we mainly manufacture CAR-T cells from peripheral blood. We are also working with another investigator, Shawn Hingten, who is using skin fibroblasts. Outside of UNC, other investigators are using adipose-derived stem cells or mesenchymal stem cells common in regenerative medicine. LH: How is UNC’s GMP facility set up? PE: The facility is 5,000 square feet, with half of the space as clean room facilities. 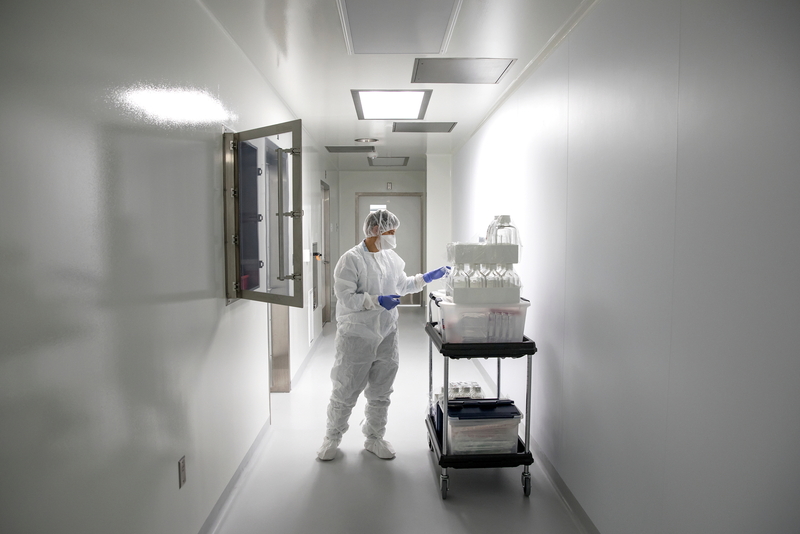 We have six separate processing rooms, five for patient samples and one with a different air system for virus protection. It’s a ISO-7 environment, meaning we use “bunny suits” and have to re-gown each time we enter or leave a room. Patient rooms are positive air-pressured to the hallway in order to minimize anything coming back into the room. The air is 80% recirculated. In contrast, the virus room is negative pressure and the air is 100% single-pass filtered with no recirculation. LH: Oh wow, there are a lot of details involved here. PE: Yes, part of building a GMP facility is paying attention to construction details. We designed ours for an academic center, which is a different layout than that for pharmaceutical manufacturing. LH: So how much of what you do in a GMP facility is automated versus manual? PE: It really depends on where you are in product development. 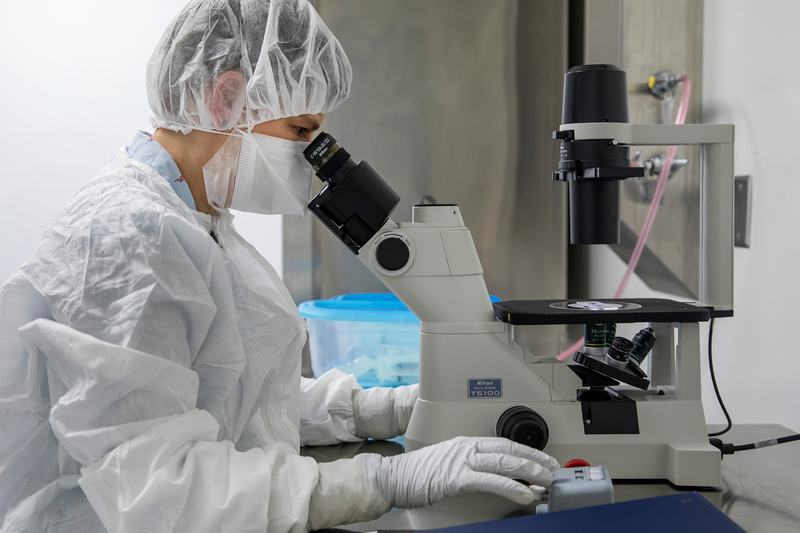 In our facility, we are focused on early phase I trials in which we have not nailed down a manufacturing process so we are pretty manual in most of our applications. Part of what we’re doing is learning how to manufacture the cells we need with minimal effort in a system that is as closed as possible. As we move to phase II, then we start looking at scaling up due to the need for more cells. This is where bioreactors can be helpful and the steps become more automated. Cell therapy is where drug manufacturing was 75 years ago, in the sense that not much is automated. But nowadays, the technology is continually advancing. Miltenyi is offering a bioreactor called CliniMACS Prodigy that makes it sound as easy as pushing a button. Katie McKay, Associate Director for Manufacturing, uses an inverted tissue culture microscope to count cells on a slide while working in the cell culture room at the UNC Lineberger Advanced Cellular Therapeutics Facility on June 16, 2017, in Chapel Hill. LH: What sort of training and skill sets are needed for someone to work at a GMP facility? PE: It breaks down into a couple of areas. One is whatever the process requires, in this case usually tissue culture (TC). We do a lot of TC as part of manufacturing cells. Another area is in regulated, quality control testing. We do a lot of characterization analysis on our cell products. We establish release specifications for every product we make so we have to do all the assays before patients can receive them. These assays aren’t necessarily done in the GMP facility, just wherever we can do it most easily. The important thing is that all the assays need to be performed in a more GMP manner than you might encounter in a basic research lab. Documentation, Standard Operating Procedures (SOPs)…we do everything by SOPs. 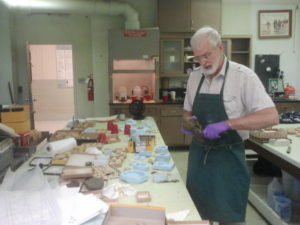 This is because we need to trace all of our materials, use everything within its expiration date, and keep up with instruments for calibration and maintenance. We also train people on site on whatever they’re doing, document the training, and ensure trainees maintain competency for quality control testing. In other words, we do all the tests you see in a typical research lab but in a more stringent, reproducible, and regulated manner. Another important skill is learning how to work in a clean environment. 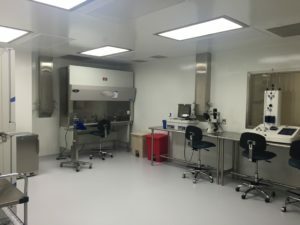 Everyone thinks they know how to use a biological safety cabinet (BSC), but there are good ways and bad ways, and there are ways you have to operate when you are trying to minimize the risk of cross contamination. So we do a lot of cleaning, and we have to document everything we do. In general, I don’t necessarily need someone with PhD credentials but I do need someone who is smart, dedicated, and extremely detail-oriented. We are looking more for personality and attitude than specific qualifications. Katie McKay, Associate Director for Manufacturing, organizes supplies while working at the UNC Lineberger Advanced Cellular Therapeutics Facility on June 16, 2017, in Chapel Hill. LH: How are careers and/or skills used at GMP facilities in academic centers different than in pharmaceutical companies? PE: Well, in an academic center you see everything, and that’s the most enjoyable part of it. 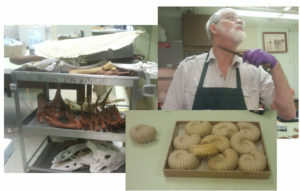 We will often break out into more research and development (R&D) work as opposed to hands-on, clean manufacturing work. People float back and forth between what they are comfortable doing. I have people with PhDs and high school degrees working in the facility. From the industry side of things, a very different set of skills is needed. That’s because by the time you get to phase II/III clinical trials, the process is set and there is no situation where you’ll be making changes. Of course, you still need to have attention to detail and be thorough, but the important aspect is to follow the instructions and nothing else. However, when something doesn’t work, you’ll need enough wherewithal to understand whether it was a process accident or a random occurrence. LH: Finally, where do you see cell therapy going in the next 25 years? PE: It’ll become more rote, with more big pharma involved. The current model, as long as we are talking about autologous starting material (i.e. cells from the same patient), is not really scaled up so much as scaled out. There are still individual batches (or lots) made for individual patients. Where will we do this? It’s still not clear where it is economically advantageous to do so. For example, Novartis has a centralized manufacturing facility [for Kymirah]. That works fine for now, but will Novartis keep up with material demands? It’s not just tissue culture media, they have to make lentiviral vector, and the suppliers right now can turn out product for only 25-30 patients at a time. No one has ever tried making 10,000 personalized products before. Moreover, the FDA requires lentiviral vectors to have a shelf life of couple years so vector suppliers are desperately trying to scale up. We are still in the early wild west stage but it is fascinating. All pictures provided by Dr. Eldridge. Peer edited by Justine Grabiec and Erin Langdon. The best models of how our world works are incomplete. Though they accurately describe much of what Mother Nature has thrown at us, models represent just the tip of the full iceberg and a deeper understanding awaits the endeavoring scientist. Peeling back the layers of the natural world is how we physicists seek a deeper understanding of the universe. This search pushes existing technology to its limits and fuels the innovation seen in modern day nuclear and particle physics experiments. 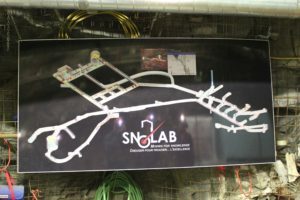 This is a map of the SNOLAB facility. It’s 2 km (~1.2 miles) underground and is the deepest clean room facility in the world! Today, many of these experiments search for new physics beyond the Standard Model, the theory physicists have accepted to describe the behavior of particles. Some physical phenomena have proven difficult to reconcile with the Standard Model and research seeks to improve understanding of those conundrums, particularly regarding the properties of elusive particles known as neutrinos which have very little mass and no electric charge, and dark matter, a mysterious cosmic ingredient that holds the galaxies together but whose form is not known. 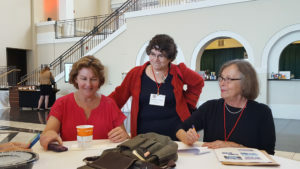 The experiments pursuing these phenomena each take a different approach toward these same unknowns resulting in an impressive diversity of techniques geared towards the same goal. On one side of the experimental spectrum, the Large Hadron Collider smashes together high-energy protons at a rate of one billion collisions per second. These collisions could have the potential to create dark matter particles or spawn interactions between particles that break expected laws of nature. On the other side of the spectrum, there is a complimentary set of experiments that quietly observe their environments, patiently waiting to detect rare signals of dark matter and other new physical processes outside the realm of behavior described by the Standard Model. As the signals from the new physics are expected to be rare (~1 event per year as compared to the LHC’s billion events per second), the patient experiments must be exceedingly sensitive and avoid any imposter signals, or “background”, that would mimic or obscure the true signal. The quest to decrease background interference has pushed experiments underground to cleanroom laboratories setup in mine caverns. While cleanrooms reduce the chances of unwanted radioactive isotopes, like radon-222, wandering into one’s experiment, mines provide a mile-thick shield from interference that would be present at the surface of Earth: particles called cosmic rays constantly pepper the Earth’s surface, but very few of them survive the long journey to an underground lab. 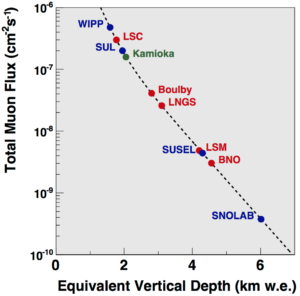 The rate at which muons, a cosmic ray particle, pass through underground labs decreases with the depth of the lab. 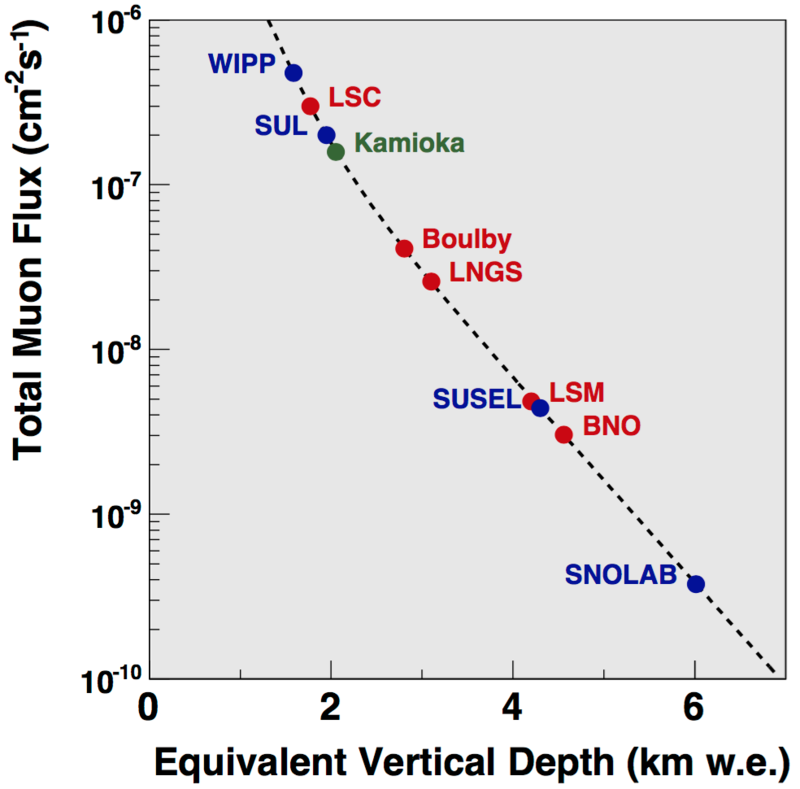 At the SNOLAB facility, shown in the lower right, approximately one muon passes through a square centimeter of the lab every 100 years. There is a natural excitement upon entering an active nickel mine, donning a set of coveralls, and catching a cage ride down into the depths; this was our entrance into the Creighton Mine during the TAUP conference. After descending an ear-popping 6800 feet in four minutes, we stepped out of the cage into tunnels— known as drifts— of raw rock. From there, we followed the path taken everyday by SNOLAB scientists, walking approximately one kilometer through the drifts to the SNOLAB campus. At SNOLAB, we prepared to enter the clean laboratory space by removing our coveralls, showering, and donning cleansuits. Inside, the rock walls are finished over with concrete and epoxy paint and we walked through well-lit hallways to a number of experiments which occupy impressively large caverns, some ~100 feet high. Physicists visiting SNOLAB get a close-up view of the DEAP-3600 and MiniClean dark matter experiments. Shown here are large tanks of water that shield sensitive liquid argon detectors located within. 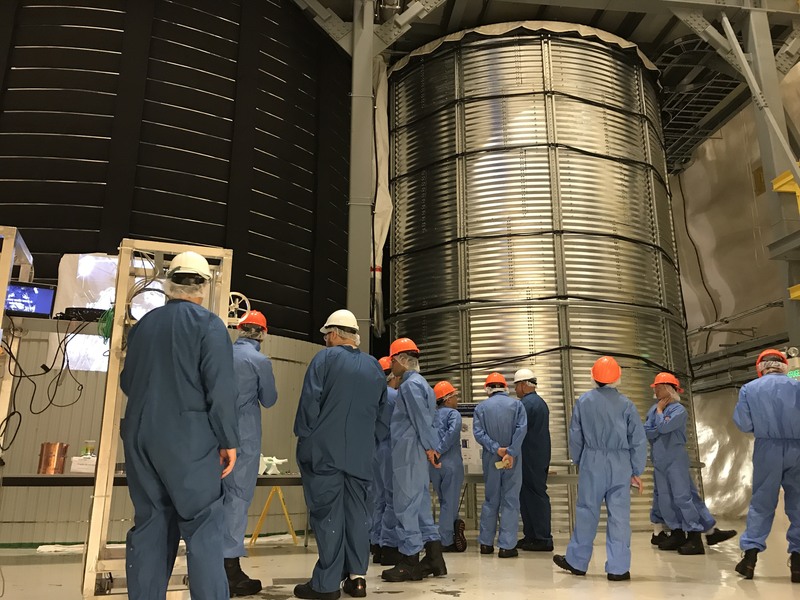 Our tour of SNOLAB included visits to several dark matter experiments, including DEAP-3600 and MiniClean, which attempt to catch the faint glimmer of light produced by the potential interaction of dark matter particles with liquid argon. A stop by PICO-60 educated visitors on another captivating experiment, which monitors a volume of a super-heated chemical fluid for bubbles that would indicate the interaction of a dark matter particle and a nucleus. The tour also included the SNO+ experiment, offering glimpses of the search for a rare nuclear transformation of the isotope tellurium-130; because this transformation depends on the nature of neutrinos, its observation would further our understanding of these particles. 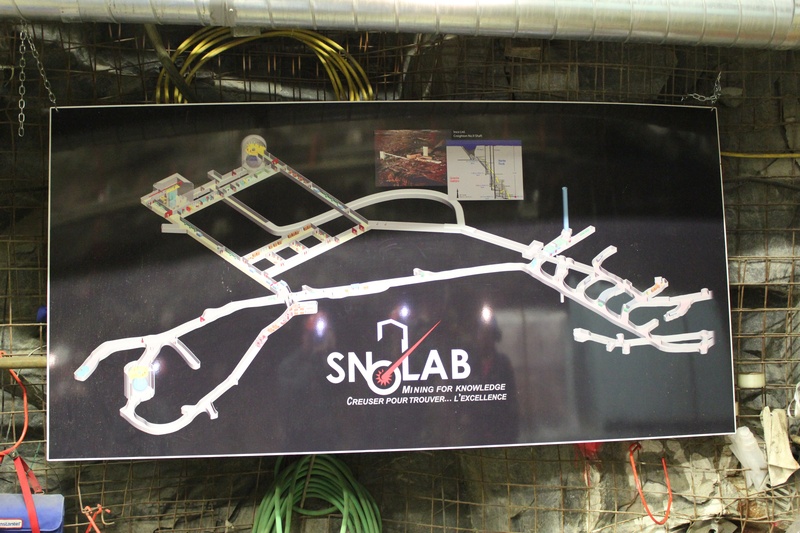 SNOLAB is also home to underground experiments from other fields. The HALO experiment, for instance, monitors the galaxy for supernovae by capturing neutrinos that are emitted by stellar explosions; neutrinos may provide the first warnings of supernovae as they are able to escape the confines of a dying star prior to any other species of particle. 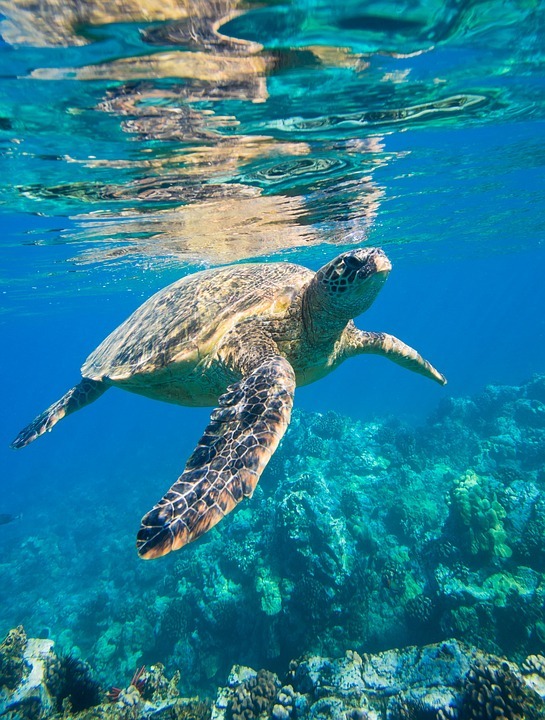 Additionally, the REPAIR experiment studies the DNA of fish kept underground, away from the natural levels of radiation experienced by all life on the surface of Earth. The search for rare signals from new physical phenomena pushed physicists far underground and required the development of new technologies that have been adapted by other scientific disciplines. The SNOLAB facility, in particular, has played a key role in helping physics revise its best model of the universe, and it can be expected that similar underground facilities around the world will continue to help scientists of many stripes reveal new facets of the natural world. Peer edited by JoEllen McBride and Tamara Vital. If a brain could talk, what would it say? Probably nothing profound or understandable. Rather, it would emit a bustling clamor of messages between neurons. These messages are delivered by chemicals called neurotransmitters. 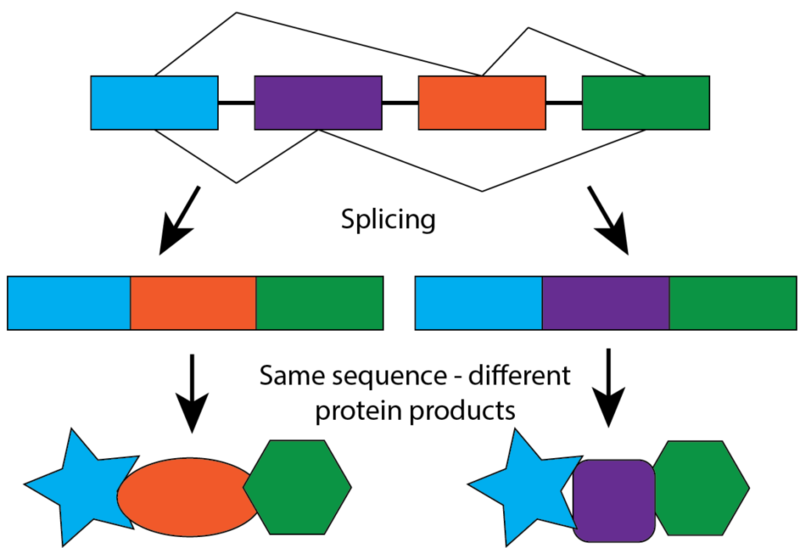 Different groups of neurotransmitters serve unique roles in the brain. Because there are so many chemicals sending so many messages, it’s often hard to know what each neurotransmitter group is saying. Scientists want to isolate the activity of individual neurotransmitter groups to better understand how these chemicals behave during both normal and abnormal behavior. To decipher this chemical chatter, scientists use a technique called fast-scan cyclic voltammetry (FSCV). FSCV allows scientists to see real-time changes in neurotransmitter activity as an animal performs a behavior. It’s a way to correlate an individual’s behavior with a certain chemical’s activity. First, scientists insert an electrode into a brain area of interest. At the electrode’s tip is an incredibly thin carbon fiber — about the width of a strand of hair. Scientists then cycle the electrical potential at the carbon fiber tip up and down like a rollercoaster. This “cycling” helps the electrode detect specific neurotransmitters. As the electrical potential cycles up and down, the neurotransmitter is oxidized and reduced — a chemical process that can be measured as a current. The electrode is like a precise microphone, magnifying the murmur of a specific neurotransmitter’s activity amidst the din of other messengers. The shape of the electric current signal often differs between different neurotransmitters, allowing scientists to tell them apart. Computer programs then convert this electric current into a concentration that scientists can measure. Translating the oxidation/reduction reaction to current is much like translating foreign speech into a language you understand, and the shape of the current is much like an accent – an identifying feature of that language. Once an electrode is in place and this translation process begins, scientists can examine how a neurotransmitter’s signal changes during certain behaviors, such as decision making. 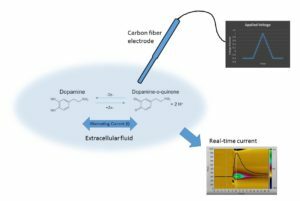 Afterward, sophisticated analyses measure the shape of the current signal to ensure that it is actually from a neurotransmitter, and not some other eavesdropping molecule or contaminant. Dopamine is one of the neurotransmitters that FSCV can measure. FSCV is incredibly useful in that it can specifically isolate and measure transmitters such as dopamine and serotonin. This is important because in many brain diseases, the chemical chatter of these neurotransmitters goes awry. For instance, dopamine deficiency is a symptom of Parkinson’s Disease, and schizophrenia often features imbalances in dopamine levels. Abnormalities in serotonin have classically been linked to depression (although that is being contested) as well as Sudden Infant Death Syndrome (SIDS). Despite all this prior knowledge, scientists still don’t know exactly how these neurotransmitters contribute to different behaviors and diseases. 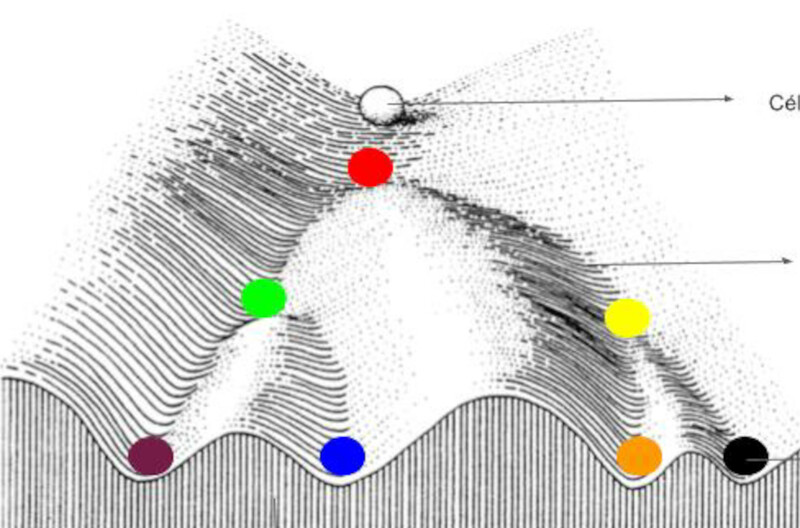 As such, FSCV is a technique that furthers our understanding of how neurotransmitters behave. Scientists can use FSCV to examine how neurotransmitters function, both normally as well as in disease states, to help unlock the secrets of treating brain diseases. Edited by Christina Marvin and Anginelle Alabanza.